The Greenhouse is an environmentally responsible family home built on acreage outside Brisbane. A wonderful collaboration between architect, builder and friends, this home represents a wonderful balance of lifestyle aspiration, sustainability agenda and rewarding process. Shaun Lockyer Architects’ first collaboration with Healthy Abode Living, this home looks to explore the simple, the crafted and poetic with regards to architectural agenda and interior fit-out. The brief was for a modest in size, new family home with a high sustainability agenda. The chosen room is the living room that expresses a warmth of materiality with invisible edges connecting the room to the landscape beyond. 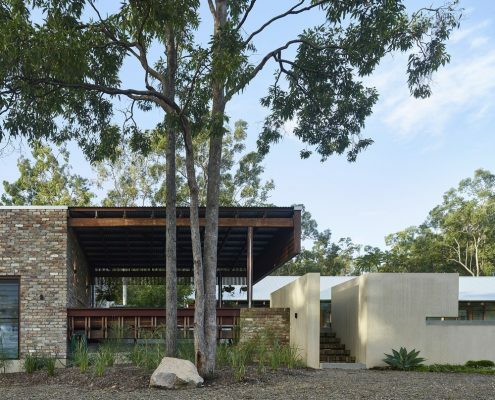 Shaun Lockyer’s clients had previously seen their Hinterland House which drew inspiration from a contemporary reinterpretation of a traditional farm house. The Greenhouse takes this a step further, exploring industrial materials, combined with rich, crafted timbers.